Protective security can no longer be treated in isolation. Knowledge on protective security has developed and essentially turned into a wide-ranging strategy via science and technology set to be effective and operative. Protective security is at the core of security science development, which offers comprehensive knowledge on leading edge security management, security principles and technologies, and other related fields with the central theme of security risk and risk management. Therefore, the Centre for IT Advancement (CITA) proudly offers a Master of Protective Security Management. This program is designed especially for those organizations dealing with critical infrastructures and key installations, such as government agencies, energy & utilities, health services, transportation, banking & finance, info & telecommunication, etc. Deliver clearly the concept of strategic, operational and tactical thinking and apply the knowledge in a socially responsible manner for the progress of the nation and the Ummah. Use the knowledge and comprehension of management principles and practices including problem solving and scientific skills within the context of security profession that add real values to their personal and organizational effectiveness. Deliver effective communication, leadership and teamwork skills as well as practice professional and ethical values in performing their role as security professionals. Demonstrate values, attitudes, professionalism and relevant framework in ICT tools and technique that assist in understanding the potential benefits and risks related to the application of ICT. Demonstrate skills in information management, and lifelong learning by acquiring qualification for further degree, and engaging in societal initiatives leading to the establishment of national level association dealing with protective security standards and professional practices. Practicing leadership skills as well as applying professional and supervisory capabilities in performing their role as security professionals. Other qualifications that are recognised by the Government of Malaysia (e.g. APEL). English language proficiency as determined by the IIUM English Placement Test (EPT) with a minimum of band 5.0. 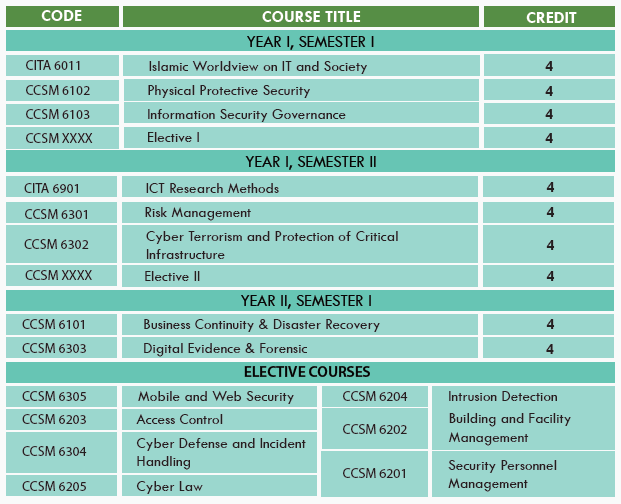 Interested in Master of Protective Security Management (MPSM) ?